Yup, I made it through the year! I didn’t have to take a day off even. I did need to take some walking days instead of runs but those met the rules 🙂 365 days (and counting) of running. 1. I ran over 1000KM. 2. I ran 5 races. I have learned a lot about myself this year, there were highs and lows. I meant to write about them, but I always found posts getting too long and that was intimidating. The summary of the highs and lows: a lot of my stuff is mental 🙂 In order to make it through the year I needed a mentor and to get over myself – I played too many mind games with myself over the years that kept adding up. That hump has been overcome. On to 2016. I will continue running every day – it has becoming a calming part in my life. I broke down today and went for a run. Peer pressure is strong; I saw a bunch of friends posting about their first run of the year and couldn’t take it any more! Today I started: 1.25KM, took me 10:32 and I did 2 minutes walking 3 minutes running just to be safe. A far cry from my usual 5:45/km but alas I need to get this right. It all started when we realized that pickling cucumbers were going to be in season while we were travelling to Ottawa and Quebec. Sometimes there comes a moment where you realize your vacation is going to put a damper on a canned good you were looking forward to making. What would you do? We had big plans to make 3 kinds of pickles this year; Icicle, Bread & Butter, and Gherkins. The Bread & Butter could be done in a day, no problem. Our Gherkin recipe takes (12) days, where the first 6 of those they just sit with no attention needed, again no problem. The Icicles, however, need attention every day for 12 days, they are also one of our favourites and the ones that were the most depleted in the pantry; big problem. Shortly after this revelation, resigning ourselves to the fact that we would have to wait another year, we ran into Joel and Dana of Well Preserved. After hearing of our bind, Joel regaled us with his story of making sauerkraut on the road (in Scotland I think). He suggested that since we were using airbnb for our trip that we bring the supplies with us and do it on the road. This course of action had originally crossed our mind however, we had quickly discounted its as hair-brained. After hearing Joel’s sauerkraut story we begin to seriously look at what would need to happen to make these pickles. It wasn’t too much: a pot, some ingredients, a colander, spoon, bucket, etc. There was only one night we wouldn’t have access to a kitchen/stove. 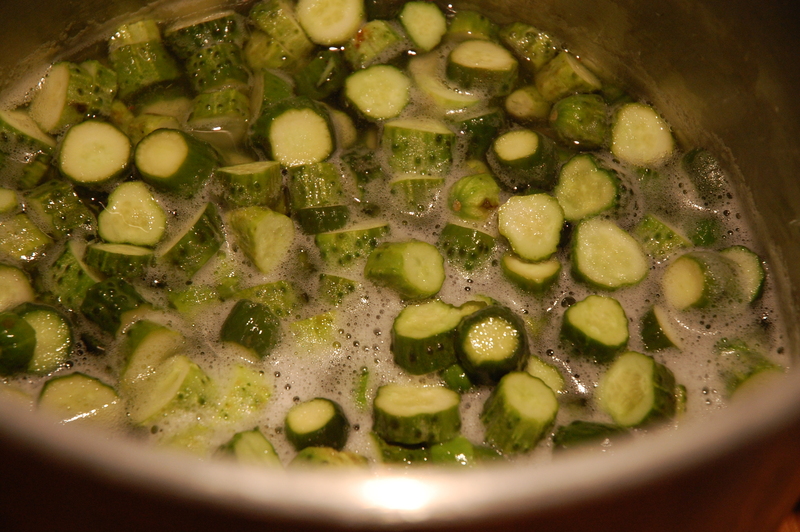 Having made these in the past we knew it only took ~ 10 min a day to process the cucumbers. We could make this work, right?! First, we made sure we could get the pickling cucumbers, Haystrom Farm came through with a half bushel for us the week before we left. 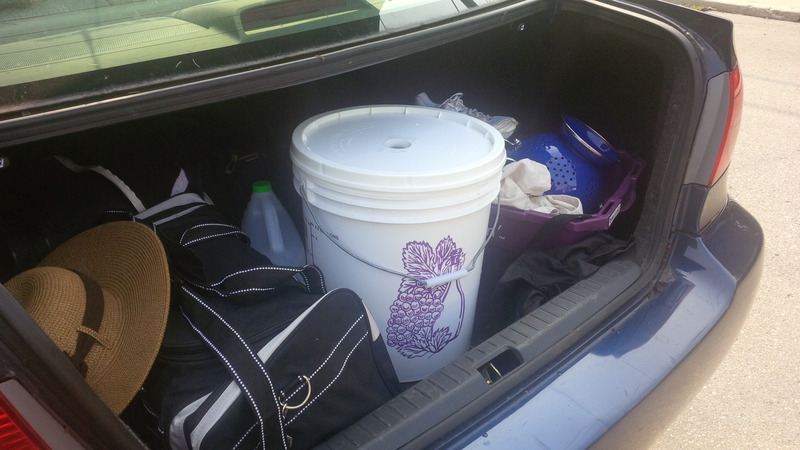 The only thing we were missing was a large bucket, preferably air tight for when it was in the car. 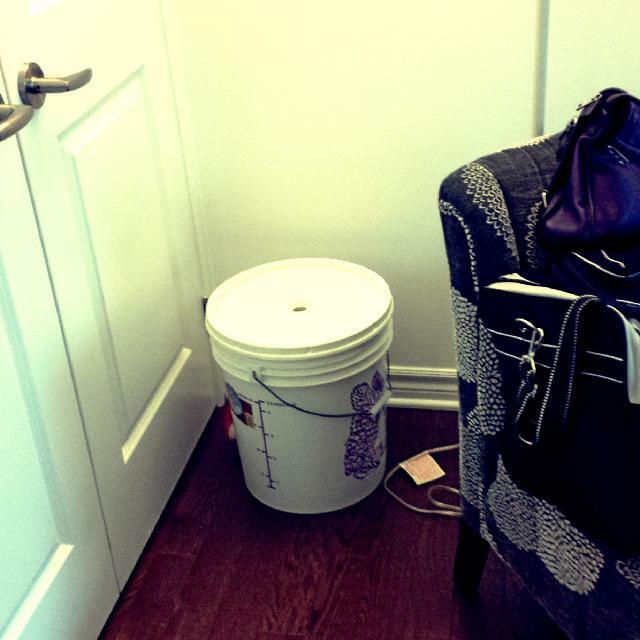 We borrowed a fermenting bucket from a friend which fit the bill perfectly. The first 7 days are pretty low intensity, we started them a week before we went on the road. They literally sit in a pot fermenting, getting stirred once a day. 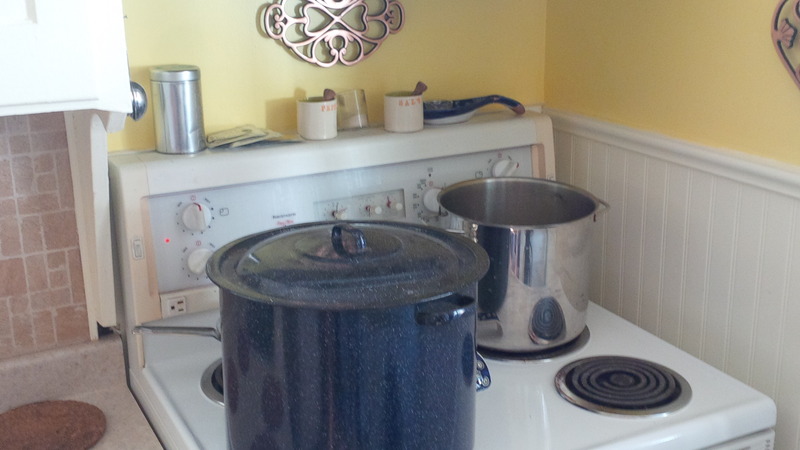 In Ottawa they sat in a corner with the lid lightly on, we stirred them when we remembered. The first day with real action we were at our friends hobby farm in Quebec. Being us, we forgot to take pictures so you’ll have to take our word it happened. 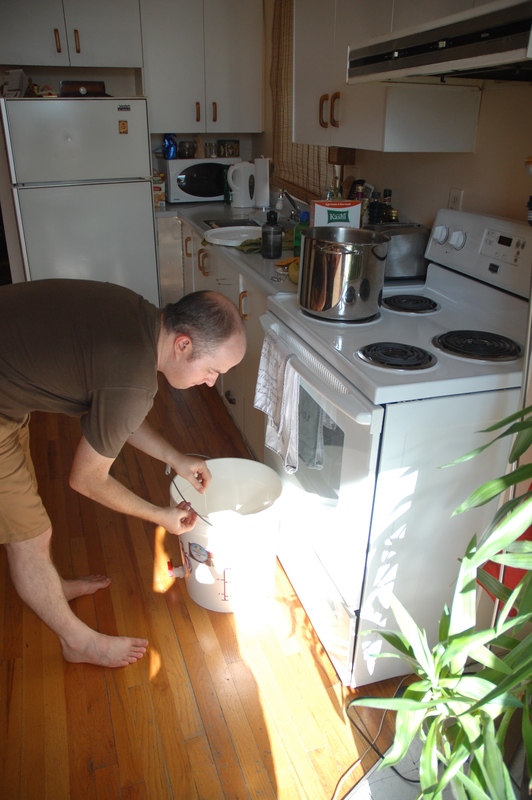 We drained the fermenting brine and replaced it with boiling water and alum. Since we were on a hobby farm nothing was wasted in this step, the fermenting brine was added to the pig slop for the next day. The pickles survived the overnight in a sealed bucket in the trunk while we pampered ourselves at a nice hotel. We ended up adding a day to the process, we were tired when we rolled into town and didn’t want to can that night, we reboiled the syrup and let the pickles sit overnight again. Sadly I can’t tell you how the pickles taste, they are still doing their thing on our canned goods shelf. They looked and smelled right though. Overall travelling and fermenting/processing of pickles worked out great. I would happily do it again, although I probably still wouldn’t can in someone elses house. That seems like a little too much work for vacation! All I wanted to do was SHA1 some passwords + salts in Oracle and then compare them when a user logs in. Is it really this difficult to do this comparison? That works but how messed up is that? Am I just going about this the hard way? This a shameless self-promotion post. Blackberry is running a contest to win a trip to their BBM Apps Hackathon, and this is me throwing my hat in the ring. For the curious, this is the event. That being said, it will also be insightful about me as a developer in some ways. Where does this story begin? I have been getting more and more interested in developing apps for Blackberry. I already have one app that does kitchen unit conversion in Blackberry App World (Kitchen Converter). It gets decent reviews, but needs polishing in my eyes. My few reviews don’t mention the things I see that need polishing, and I think that surprises me most. I think the most important learning I took from that app was that developing a solid base product is the smartest thing you can do. Put something out there that you are proud of, something that works. While developing an app, keep a list of all the features you think it should have and add those in after you get the base released. Nothing is worse than downloading an app (or worse paying for an app) that has all the features you want, but does none of them right. It is hard to recover from bad reviews. Another great use of social apps is networking. How trying can networking be? You know it is. At FITC Toronto 2011 they had a fist-bump type app so you could keep track of people you met. Two (or more) people went to the booth, bumped their tags and it sent them contact details of everyone you bumped with afterwards. (Check it out). While I didn’t participate in it, the idea was amazing! Such a great way to use social to improve a sometimes old school process. There are so many other innovative ways that sharing/social can be used. I would give more examples, but the two left in my head are for apps I am currently or planning to develop. Nothing else seems to be able to push those ideas out for me to talk about. But Rory, why should you of all people attend? I have just started developing apps for BB. I probably don’t have the experience of some seasoned BB developers. And that is precisely why I should attend. Think about what I can get out of this experience. I have so much to learn, but also many years of transferable skills to learn with. I have tried out Adobe Air development for the Playbook, even developed an app for it. That was a a bit of a learning curve. I wasn’t sure I would be able to keep developing apps if they all took that long. I had so many ideas but they were all out of my comfort zone, each feature required time to research the proper syntax to make it happen. And I made it happen, no matter how frustrating it might have been, I grew a little bit because of it. Then I discovered the WebWorks platform, which was more my speed. After spending the last 18 years doing HTML, JS, CSS, XML and many other acronyms of development for the web, I felt right at home. I could conceptualize a feature and code it within minutes or hours depending on the complexity (rather than hours or days). WebWorks also makes my code portable. I can push it to many different BB devices. Once those are released, with minor changes it can be made into a web app and used on multiple platforms!! How awesome is that? I would consider this a great learning experience, and it would allow me to learn as much as I can from the best of the best. I have so many ideas for apps, my only limit for pumping them out is time in the day. Having 2 days of expert help would definitely help me pump at least one of my apps out! Some other pluses in my corner: am quick on my feet and I learn by doing. This sort of event is exactly what I need to take my BB development to the next level. 1. It makes it super easy to share things with friends and family. It is built right in, no loading another app, no hoping the person has said app. 2. It allows me to know the status of things. I know right away when it is delivered/read. This is creepy sometimes, but when trying to plan a meet-up with my wife or pass along important information it is nice to have that confirmation. 3. I can write more than I would in a text message. Nothing like checking text message 2 of 2 before 1 of 2. Auto-send on signal in the proper order is also pretty cool! 4. I love that iOS basically stole the BBM idea and made their own, Imitation is the sincerest form of flattery. 5. Last, but certainly not least ,without BBM there would be no hackathon, and with no hackathon I would be stuck in the basement writing my code alone, relying only on myself to learn the right way to do things. I also wouldn’t get to spend a couple days in wonderful NYC! There you have it my entry, almost feels like a job interview/cover letter. Dr. Seuss – Oh, the Places You’ll Go! Started spending time cleaning up duplicate images and files. What a trip down memory lane. Found all kinds of pictures I forgot about!